A love that suffered and rose triumphant above the crushing events of this modern age! The march of time measured by a mother's heart! This Best Picture Academy Award Winner based on Noel Coward's classic play arrives on Blu-Ray for the first time ... A British family's triumphs and tragedies unfold across the decades of the early twentieth century. From World War I to the sinking of the Titanic, this sweeping saga captures the cavalcade of life like no film before. Way back in the year 2000, I noticed that some other sites offered pages that detailed which Oscar Best Pictures were available on DVD. I thought it’d be fun to give this its natural extension and create a special page devoted to reviews of all those trophy winners. We started with a few dozen reviews and expanded from there to include almost every BP victor. “Almost” being the key word – until today. 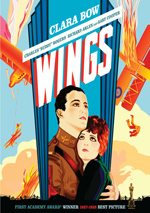 Not counting new winners each year, we last updated the page in early 2012 with 1927’s Wings. Summer 2013 allowed me to finish off the Oscar backlog with the lone holdout, 1933’s Cavalcade. Though I feel awfully excited to finally fill out that Oscars page, I can’t offer quite as much enthusiasm for Cavalcade itself. The film starts on New Year’s Eve 1899, as we meet a privileged London family headed by Robert Marryot (Clive Brook) and his wife Jane (Diana Wynyard). The setting seems more glum than celebratory, however, as both Robert and household manservant Alfred Bridges (Herbert Mundin) will soon go off to South Africa to fight in the Boer War. Both eventually return home safe just in time for another major event: the death of Queen Victoria. From there we follow the Marryot and Bridges clans – with an emphasis on Alf’s wife Ellen (Una O’Connor) and various offspring - as they experience a variety of historical moments and also go through their own life changes that lead up to then-present day 1933. If nothing else, I guess Cavalcade influenced later productions such as Upstairs, Downstairs with its dual emphasis on both the wealthy and the working class. I don’t know if that was unusual back in 1933, but it does offer a theoretically interesting way to examine historical events. Too bad the framework does little more than ensure that none of the characters become more than thin archetypes. The actors try their hardest to add some depth to the roles, but the movie skips along with such abandon that they can’t develop the parts past the level of loose sketches. These are dull, one-dimensional participants about whom one finds it awfully tough to care, no matter how hard the movie tries to prod us with shameless stabs at emotion. How shameless? How about the scene with the honeymooning lovers that ends with a shot of a life preserver that reads “Titanic”? Woof – that’s pretty hamfisted, and ineffective to boot, as the reveal seems more likely to prompt eye-rolling than tears. How is it possible for a film to cover so many years and yet demonstrate so little real drama or material of interest? The characters all fade into the background, so we’re left with thoughts about those real-life events as the only meat on this bone. That’s not enough, and the result feels like little more than a stuffy, less self-aware flick in the Forrest Gump vein. Even with so many years to cover, Cavalcade feels slow and tedious. It comes with odd distractions such as a long scene in which we watch a musical production. I’d guess this made the film just to add some song and dance to the movie; it has a few counterparts as well, and none of them offer any real narrative purpose. In retrospect, it looks like Oscar was on an “every other” plan for the first few years of awards. The first, third, fifth and seventh Best Picture winners were all quite good. Victors two, four and six? Not so much. Well, at least Cavalcade - the sixth Best Picture – holds up better than Broadway Melody or Cimarron, winners two and four, but that’s faint praise. Cavalcade takes an ambitious story and renders it inert via forgettable characters and a lack of depth. 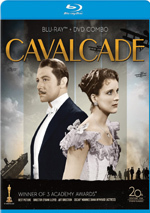 Cavalcade appears in an aspect ratio of approximately 1.33:1 on this Blu-Ray Disc. While perfectly adequate for an 80-year-old movie, the transfer never became anything special. Like all parts of the picture, sharpness varied. Much of the film looked acceptably distinctive and defined, but exceptions occurred. Though the flick never turned mushy, some noticeable softness came out at times. I saw no problems with jagged edges or shimmering, and edge haloes remained absent. Given the high level of grain, I didn’t suspect any overly zealous digital noise reduction. As one might expect for an old movie like this, source flaws were a concern. The film exhibited examples of specks, grit, marks, scratches, lines and spots. I didn’t think these were excessive for such an old release, but the film certainly could’ve looked much cleaner. Blacks were erratic but usually came across as reasonably dense; only occasional shots looked a bit inky. Shadows tended to appear slightly opaque and could be somewhat tough to discern, though not badly so. Enough good came out here to warrant a “C”, but I can’t say I thought the transfer was better than that. I found the monaural soundtrack of Cavalcade was similarly passable. Speech showed metallic, thin tones but always remained intelligible and lacked much edginess. Music popped up sporadically. As with most movies of the era, this one didn’t use a lot of score, though a long musical sequence meant Cavalcade had more material of this sort than most of its peers. When we heard music, it seemed a little bright and shrill, but those elements seemed adequate for their age. Effects fell into the same vein. They lacked much distortion but failed to deliver a lot of life or vivacity. As with the other components, they were perfectly acceptable given their age but they didn’t rise above that level. I noticed some hiss and background noise at times, though not to a heavy degree. Again, this was a fairly typical mix for a movie from 1933. Two extras show up here, and we open with an audio commentary from film historian Richard Schickel. He offers a running, screen-specific look at the original play and its adaptation, cast and crew, story/character areas, some historical tidbits and interpretation of the film. Like most Schickel commentaries, this one provides a consistently inconsistent experience. At his best, Schickel gives us good insights into the film’s era, including notes about Hollywood and the world at large. At worst, however, Schickel goes silent too much and tends to narrate the movie. Those tendencies become more obvious in the flick’s second half; dead air dominates and useful tidbits seem few and far between. If you screen this piece, don’t expect much, as it’s a typical erratic Schickel commentary. A Fox Movietone News piece called “Cavalcade Wins First Honors” lasts one minute. In this, director Frank Lloyd congratulates producer Winfield Sheehan and actors Clive Brook and Diana Wynyard on the movie’s Best Picture nomination. The short’s title seems odd since it doesn’t appear to come from the film’s victory. Whatever the case, it’s an inconsequential trifle, though maybe if Schickel watched it, he might learn the actor’s name isn’t “Brooks”. A second disc provides a DVD copy of the film. It includes the same extras as the Blu-ray. I don’t dislike Cavalcade enough to classify it as one of the absolute worst Oscar winners, but it’s still much closer to the bottom than to the top. The movie comes with admirable ambition but fails in terms of execution, as it seems slow, plodding and forgettable. The Blu-ray provides mediocre picture and audio along with a mediocre commentary. Cavalcade deserves a look due to its Oscar pedigree, but viewers shouldn’t expect much from it.